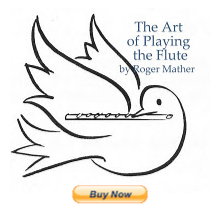 When you're thinking ahead about planning your own professional or advanced-level flute recitals, there is one fantastic resource on the web that we can all use for inspiration. Flutist Fenwick Smith (one of my perennial favourites!) has given us the programme notes and recital repertoire for over thirty of his annual recitals. What a cornucopia of pieces, composers, and ideas. Tons of little known flute works stand beautifully beside the "old chestnuts" of the flutist's repertoire. There is so much to learn by following a great flutist's recital footsteps. Explanation of his recital path is here. Thirty Recitals with full program notes are here.